Thyroidectomy is a surgical procedure in which all or part of the thyroid gland is removed. The thyroid gland is located in the forward (anterior) part of the neck just under the skin and in front of the Adam's apple. The thyroid is one of the body's endocrine glands, which means that it secretes its products inside the body, into the blood or lymph. The thyroid produces several hormones that have two primary functions: they increase the synthesis of proteins in most of the body's tissues, and they raise the level of the body's oxygen consumption. All or part of the thyroid gland may be removed to correct a variety of abnormalities. If a person has a goiter, which is an enlargement of the thyroid gland that causes swelling in the front of the neck, the swollen gland may cause difficulties with swallowing or breathing. Hyperthyroidism (overactivity of the thyroid gland) produces hypermetabolism, a condition in which the body uses abnormal amounts of oxygen, nutrients, and other materials. A thyroidectomy may be performed if the hypermetabolism cannot be adequately controlled by medication, or if the condition occurs in a child or pregnant woman. Both cancerous and noncancerous tumors (frequently called nodules) may develop in the thyroid gland. These growths must be removed, in addition to some or all of the gland itself. Screening tests indicate that about 6% of the United States population has some disturbance of thyroid function, but many people with mildly abnormal levels of thyroid hormone do not have any disease symptoms. It is estimated that between 12 and 15 million people in the United States and Canada are receiving treatment for thyroid disorders as of 2002. In 2001, there were approximately 34,500 thyroidectomies performed in the United States. Females are somewhat more likely than males to require a thyroidectomy. A thyroidectomy begins with general anesthesia administered by an anesthesiologist. The anesthesiologist injects drugs into the patient's veins and then places an airway tube in the windpipe to ventilate (provide air for) the person during the operation. After the patient has been anesthetized, the surgeon makes an incision in the front of the neck at the level where a tight-fitting necklace would rest. The surgeon locates and takes care not to injure the parathyroid glands and the recurrent laryngeal nerves, while freeing the thyroid gland from these surrounding structures. The next step is clamping off the blood supply to the portion of the thyroid gland that is to be removed. Next, the surgeon removes all or part of the gland. If cancer has been diagnosed, all or most of the gland is removed. If other diseases or nodules are present, the surgeon may remove only part of the gland. The total amount of glandular tissue removed depends on the condition being treated. The surgeon may place a drain, which is a soft plastic tube that allows tissue fluids to flow out of an area, before closing the incision. The incision is closed with either sutures (stitches) or metal clips. A dressing is placed over the incision and the drain, if one has been placed. People generally stay in the hospital one to four days after a thyroidectomy. Thyroid disorders do not always develop rapidly; in some cases, the patient's symptoms may be subtle or difficult to distinguish from the symptoms of other disorders. Patients suffering from hypothyroidism are sometimes misdiagnosed as having a psychiatric depression. Before a thyroidectomy is performed, a variety of tests and studies are usually required to determine the nature of the thyroid disease. Laboratory analysis of blood determines the levels of active thyroid hormones circulating in the body. The most common test is a blood test that measures the level of thyroid-stimulating hormone (TSH) in the bloodstream. Sonograms and computed tomography scans ( CT scans ) help to determine the size of the thyroid gland and location of abnormalities. A nuclear medicine scan may be used to assess thyroid function or to evaluate the condition of a thyroid nodule, but it is not considered a routine test. A needle biopsy of an abnormality or aspiration (removal by suction) of fluid from the thyroid gland may also be performed to help determine the diagnosis. If the diagnosis is hyperthyroidism, a person may be asked to take antithyroid medication or iodides before the operation. Continued treatment with antithyroid drugs may be the treatment of choice. Otherwise, no other special procedure must be followed prior to the operation. There are definite risks associated with the procedure. The thyroid gland should be removed only if there is a pressing reason or medical condition that requires it. As with all operations, people who are obese, smoke, or have poor nutrition are at greater risk for developing complications related to the general anesthetic itself. Hoarseness or voice loss may develop if the recurrent laryngeal nerve is injured or destroyed during the operation. Nerve damage is more apt to occur in people who have large goiters or cancerous tumors. Hypoparathyroidism (underfunctioning of the parathyroid glands) can occur if the parathyroid glands are injured or removed at the time of the thyroidectomy. Hypoparathyroidism is characterized by a drop in blood calcium levels resulting in muscle cramps and twitching. Hypothyroidism (underfunctioning of the thyroid gland) can occur if all or nearly all of the thyroid gland is removed. Complete removal, however, may be intentional when the patient is diagnosed with cancer. If a person's thyroid levels remain low, thyroid replacement medications may be required for the rest of his or her life. A hematoma is a collection of blood in an organ or tissue, caused by a break in the wall of a blood vessel. The neck and the area surrounding the thyroid gland have a rich supply of blood vessels. Bleeding in the area of the operation may occur and be difficult to control or stop. If a hematoma occurs in this part of the body, it may be life-threatening. As the hematoma enlarges, it may obstruct the airway and cause a person to stop breathing. If a hematoma does develop in the neck, the surgeon may need to perform drainage to clear the airway. Most patients are discharged from the hospital one to four days after a thyroidectomy. Most resume their normal activities two weeks after the operation. People who have cancer may require subsequent treatment by an oncologist or endocrinologist. The mortality of thyroidectomy is essentially zero. Hypothyroidism is thought to occur in 12–50% of persons in the first year after a thyroidectomy. Late-onset hypothyroidism develops among an additional 1–3% of persons each year. Although hypothyroidism may recur many years after a partial thyroidectomy, 43% of recurrences occur within five years. Mortality from thyroid storm, an uncommon complication of thyroidectomy, is in the range of 20–30%. Thyroid storm is characterized by fever, weakness and wasting of the muscles, enlargement of the liver, restlessness, mood swings, change in mental status, and in some cases, coma. Thyroid storm is a medical emergency requiring immediate treatment . After a partial thyroidectomy, thyroid function returns to normal in 90–98% of persons. Injections of radioactive iodine were used to destroy thyroid tissue in the past. This alternative is rarely performed in 2003. Bland, K. I., W. G. Cioffi, and M. G. Sarr. 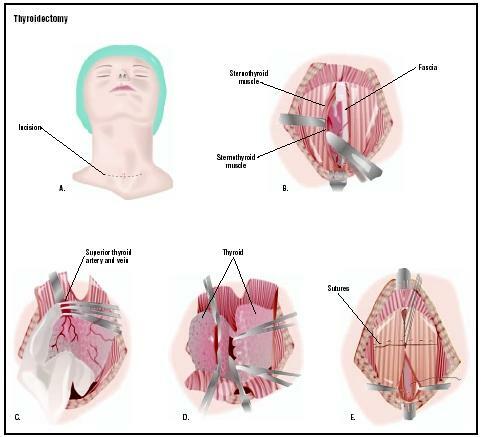 Practice of General Surgery . Philadelphia, PA: Saunders, 2001. Ruggieri, P. A Simple Guide to Thyroid Disorders: From Diagnosis to Treatment. Omaha, NE: Addicus Books, 2003. Saheen, O. H. Thyroid Surgery . Boca Raton, FL: CRC Press, 2002. Schwartz, S. I., J. E. Fischer, F. C. Spencer, et al. Principles of Surgery , 7th ed. New York: McGraw-Hill, 1998. Townsend, C., K. L. Mattox, R. D. Beauchamp, et al. Sabiston's Review of Surgery , 3rd ed. Philadelphia, PA: Saunders, 2001. Bellantone, R., C. P. Lombardi, M. Raffaelli, et al. "Is Routine Supplementation Therapy (Calcium and Vitamin D) Useful After Total Thyroidectomy?" Surgery 132 (December 2002): 1109-1113. Dror, A., M. Salim, and R. Yoseph. "Sutureless Thyroidectomy Using Electrothermal System: A New Technique." Journal of Laryngology and Otology 117 (March 2003):198-201. Ikeda, Y., H. Takami, Y. Sasaki. "Clinical Benefits in Endoscopic Thyroidectomy by the Axillary Approach." Journal of the American College of Surgery 196 (February 2003): 189-195. Oey, I. F., B. D. Richardson, and D. A. Waller. "Video-Assisted Thoracoscopic Thyroidectomy for Obstructive Sleep Apnoea." Respiratory Medicine 97 (February 2003): 192-193. American College of Surgeons. 633 North St. Clair Street, Chicago, IL 60611-3231. (312) 202-5000; FAX: (312) 202-5001. http://www.facs.org . Association of Thyroid Surgeons. 717 Buena Vista St., Ventura, CA 93001, FAX: (509) 479-8678. http://www.thyroidsurgery.org . Beth Israel Deaconess Medical Center/Harvard University. http://www.bidmc.harvard.edu/thyroidcenter/edu-thysur.asp . (April 3, 2003). Columbia University School of Medicine. http://www.cpmcnet.columbia.edu/dept/thyroid/surgeryHP.html . (April 3, 2003). Cornell University Medical College. http://www.med.cornell.edu/surgery/endocrine/thyroid.html . (April 3, 2003). University of California-San Diego School of Medicine. http://www-surgery.ucsd.edu/ent/PatientInfo/th_thyroid.html . (April 3, 2003). Thyroidectomies are usually performed by surgeons with specialized training in otolaryngology, head and neck surgery. Occasionally, a general surgeon will perform a thyroidectomy. The procedure is performed in a hospital under general anesthesia. Which parts of the thyroid will be removed? What will my neck look like after surgery? Is the surgeon a board certified otolaryngologist? Will I need any medications after surgery? I will be having thyroidectomy surgery just wanted to know how long will the surgery take? Linda: From the information you gave, I would advise you to seek the services of an endocrinologist. Many times a general internal medicine or even family physician can manage thyroid hormone replacement, but if you are having this many problems get an expert's help. Secondly, it is usually VERY important not to switch suppliers of your thyroid medication. Most medications generic drugs are equivalent. This is not true for thyroid hormone replacements. a 250 mcg dose of generic synthroid from supplier A may not provide an exact bioequivalent (i.e. what your body actually "sees" internally") dose as a 250 mcg dose from supplier B. So pick a drug and a pharmacy and stick with it, and then adjust the dosage of the drug. Third, make sure your doctor makes the changes to your thyroid hormone. Don't cahnge the dosage yourself. I am an otolaryngologist, but choose to remain anonymous for several reasons. I hope this helps you though. Chin up. i really enjoyed reading the information on Thyroidectomy. I am having a total Thyroidectomy on October 12,2006. I don't feel scared now. And my doctor he's wonderful. Thank you! Hello..My name is Chelly and I'm in the high school now. I'm Indonesian. I want to be an endocrinologist. I have known about thyroid well, especially in hyperthyroid disease. Thank you for your information about thyroidectomy. I've learned much from it. Thank you very much for the accurate information.After months of hypermetabolism, I had to convince my GP that something was wrong( she said I was going through menopause). I just had a right side 5cm. nodule/thyroid removed 10 days ago and feel great. I am an athlete, 51 year old female and in good condition and was able to ride 25 miles today on my bike. I was most wanting to learn more about my thyroid function post surgery.If you can provide any more information, I would appreciate that very much. Came home post op today from a total thyroidectomy. Aside from the scare of possible follicular cancer and awaiting the biopsy, my team was terrific with my care and I was left with a very very sore feeling in the front of the neck and after some motrin and a few hours not so bad. I came home 23 hours after the surgery and here I am typing about my experience. My multinodular goitre was very large and my neck looked like it belonged to a football player. Tonight not so much! Maybe in a few weeks I'll be wearing my necklaces without feeling like I am choking in them!!! Take care - you will be fine. Even if it is an encapsulated cancer in the nodule, I'm told an I-131 radioactive iodine tablet/pill gets rid of it after the surgery. thank you for your information about thyroidectomy, its a big help on me specialy on my profession ive take which is nursing, im on third level of learning righth now and have a case presentation about this procedure. Thank you very much for the information. This will be very useful in the report that I will be doing for our health care class. Thank you so much. I'm a student nurse and just had a patient who had thyroidectomy. Now I can share what I've learned about the procedure and about her over-all condition. AHMM.. what are the nursing responsibilities of the nurse after the surgery? Very clear presentation, easily understood by the layman. Question: If the patient has a hoarse voice after surgery, will the voice return to normal? If so, how long will it take? Just had a thyroidectomy,on tuesday last week. Wanted to be sure of certain things. Left the hospital yesterday.The surgeon, managed the situation well. At first, I had breathing difficulties, but it was quickly arrested. Would like to know what to do after a thyroidectomy. Will drugs be needed, and also any other info I need to be aware of. Thankyou. I went through the thyroidectomy surgery to remove my thyroid gland and lymph nodes and is now suffering weakness on my right arm. I can't stretch out and lift up my right arm. Physiotherapist said it will take months for the nerve to recover. Is it a common risk to suffer a stretched nerve in the thyroidectomy surgery? My wife had surgery where removed her thyroid glan February 2009.Since then she experience difficalties with calcium levels.She had 2 "fits" already.Medication she use are:eltroxen,One Alpha and Sandoz.We spoke to the doctor yesterday and said it looks like she will be on the medication for rest of her life.Every now and then the calcium levels are going down(aprox once every 2months)taking the medication like she is told to.Why does her Calcium levels go down and why cant her body regulate the levels on its own?Symptoms are her hands,fingers and feet are cramping and get heavy headaches.Sometimes one half of her face goes funny(feels like needles,loose eye sight on paricular side and musles cramps).What other medication can she use and why does her body not regulate the levels on its own?Why medication for rest of her life? I'm a surgical technology student and we are doing procedure paper and have to find information on how the wounds are classified, the name and care of the specimen, what is counted and when for the procedure, patient positioning and positioning concerns, incision location and proper name, and type of anesthesia used. It would be beneficial to us students if this type of information is included. Is there any restrictions in diet after total thyroidectomy? I had a partial thyroidectomy in 2005 due to a genetic deficiency goiter. Two parathyroid glands were also removed due to being entangled with the goiter. Twice this year I have been diagnosed with extremely low Vitamin D levels. 20 instead of 50-70. Could my thyroidectomy be the cause of my low vitamin D? I am having a partial thyroidectomy June 2015. Are there any exercises I could do before or after the surgery to help with the healing of the muscles that are disturbed during the procedure? I recently underwent partial thyroidectomy and had to be re-opended a few hours later due to large hematoma. Multinodular thyroid with suspicion of cancer which proved to be benign. Now on Eltroxin to prevent rest of thyroid getting bigger than what it already is from doing work of both sides of thyroid. Noticed very emotional, mood swings, lethargy and pains in legs. Weakness. How long will it take my hormones to settle? Thank you for your answer. Six hours after total thyroidectomy Nov 14, 2016 my neck started swelling and I couldn't breathe well. I could feel the swelling happening. I developed a hematoma and was rushed back to OR for emergency surgery. Felt like I was suffocating. I believe this was the scariest few minutes of my life so far. Now I have a big ball on my neck. Thank God I was still.in the hospital, and my daughter was there. A have done right side of thyroidectomy at 16/08/2018.. the piopsy report is papilaricarsinom of thyroide.. now6/10/2018 doctor suggested to go total thyroidectomy.. I am scared bicoz general anesthesia is give in 8mg of my body.. but still I have feel pain and breathing is also not my control..